Figure 1: Type II supracondylar fracture with minimal displacement evidenced by the anterior humeral line no longer intersecting the middle third of the capitellum. Courtesy of A. Prof Frank Gaillard, radiopaedia.org, rID 10445. Which physical examination test of nerve function is most likely to be abnormal with a supracondylar fracture? The most common associated injury with supracondylar fractures is a neuropraxia involving the anterior interosseus branch of the median nerve. This type of nerve palsy prevents the ability of the patient to adequately perform an “A-OK” sign but often resolves spontaneously. “Thumbs up” (extension) tests the posterior interosseus branch of the radial nerve, and crossed fingers tests the ulnar nerve, both of which should be intact in the vast majority of supracondylar fractures. Most commonly occur in children aged 5-7 years, with equal distribution between males and females. FOOSH (fall on outstretched hand) is most common mechanism. 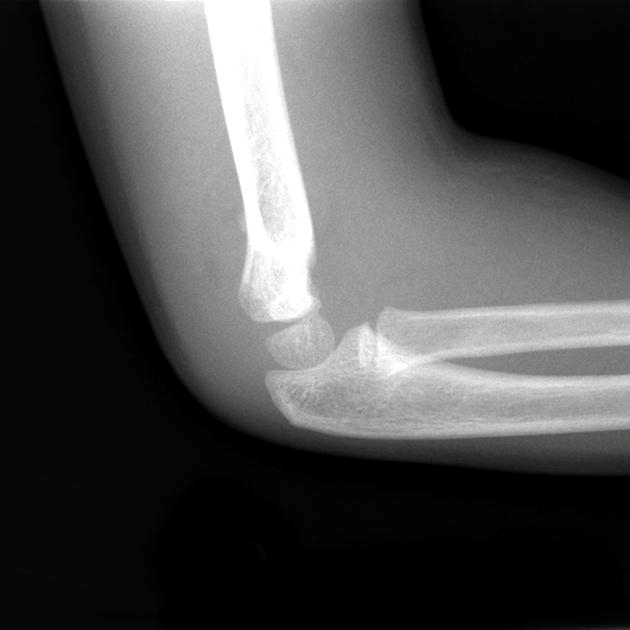 Anatomy of this 8-year-old patient is particularly important, especially when assessing ossification centers of the elbow. It’s time to reach back into the recesses of medical school musculoskeletal knowledge and remember “CRITOE,” the most common mnemonic used to recall elbow ossification centers. Figure 2: Elbow ossification centers, AP and lateral views. Images courtesy of orthobullets.com, Ujash Sheth and Chris Souder. Figure 3: Ages of ossification and fusion of elbow anatomy. Table courtesy of orthobullets.com, Ujash Sheth and Chris Souder. +/- one year, varies between boys and girl. Figure 4: Gartland classification for supracondylar fractures. Courtesy of Benoudina Samir, radiopaedia.org, rID 39938. Nonoperative management with a long arm posterior splint, followed by casting for 3 weeks is indicated for type I fractures. Closed reduction is required for type II fractures which exhibit >20 degrees of angulation. Open reduction and fixation is required for fractures with inadequate closed reduction, largely encompassing type III fractures. The patient underwent closed reduction under procedural sedation in the Emergency Department, and a long arm cast was placed by Orthopedics. When interpreting radiographs, the anterior humeral line should intersect the middle third of the capitellum, as seen on the image below. The capitellum displaces posteriorly in an extension-type fracture. CRITOE is a useful mnemonic to remember the order of ossification centers for pediatric patients with elbow pain. Figure 5: Normal alignment of the anterior humeral line and the middle third of the capitellum. Courtesy of A. Prof Frank Gaillard, radiopaedia.org, rID 10343. Abzug, JM, Herman, MJ. Management of supracondylar humerus fractures in children: current concepts. J Am Acad Orthop Surg. 2012; 20(2): 69-77. Cicero M. Chapter 82: Musculoskeletal Disorders in Children. Tintinalli’s Emergency Medicine: A Comprehensive Study Guide. 7th ed. 2011: 386-393. Kim TJ, Sponseller PD. Pediatric supracondylar humerus fractures. J Hand Surg Am. 2014; 39(11):2308-11. Sheth U, Souder, C. ‘Supacondylar fracture – pediatric.’ Orthobullets. Orthobullets.com. 13 May 2016. Web. Accessed 27 May 2016.